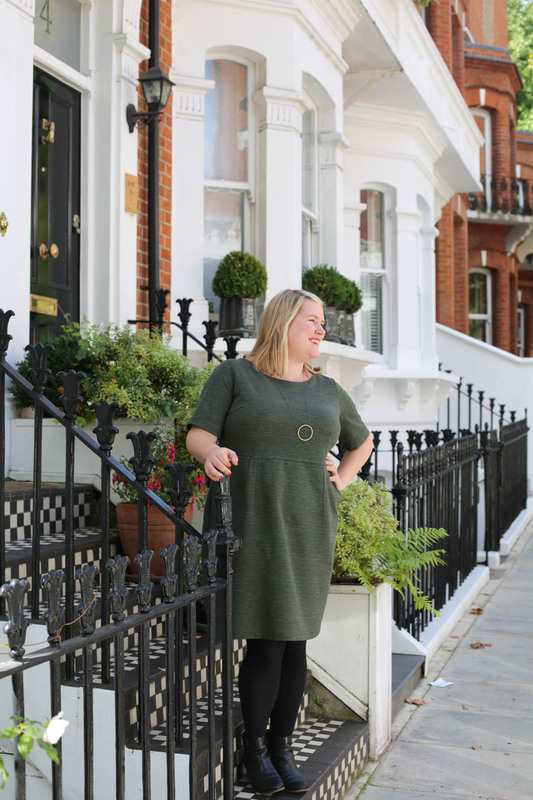 Thanks so much for your enthusiastic response to the release of the Cashmerette Rivermont Dress & Top sewing pattern! It’s been one of our biggest launches to date, so I can tell you’re as psyched at the idea of comfortable style as I am. 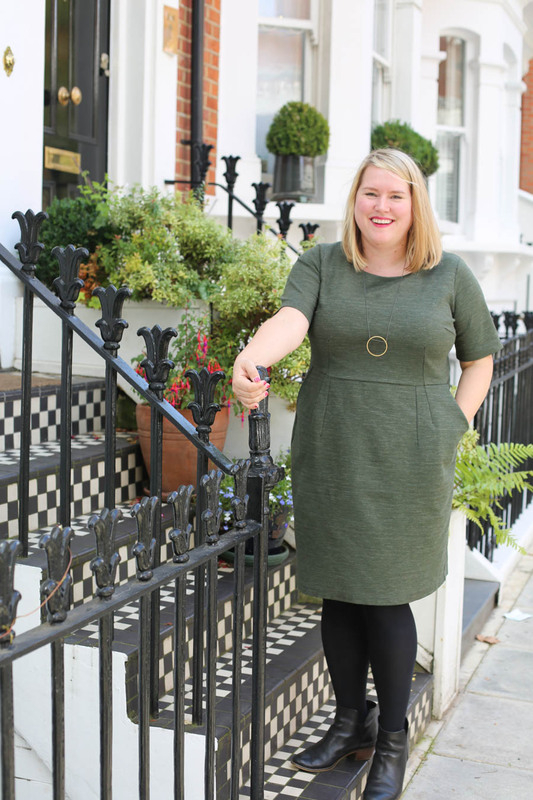 When I was first developing the pattern, I thought of it mostly as a great work dress – it’s modest but fitted, and the ponte means you’ll be at ease sitting at a desk all day. But, I don’t have a real “job” any more – or at the very least I don’t work in a corporate office – so I assumed maybe it was a pattern I’d wear less. 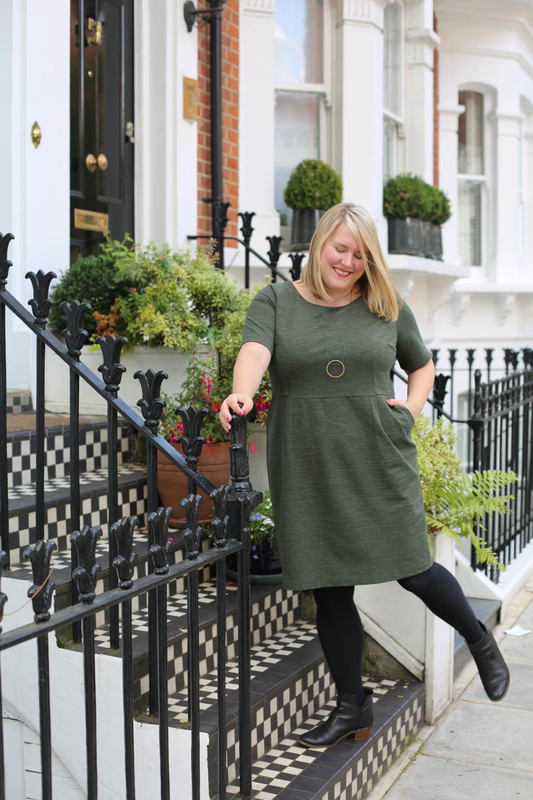 When we did the shoot, Carrie styled the green heathered ponte dress (still available as a kit! Get yours here) with black tights and ankle boots, which I’ll be honest: I never would have thought of. And as luck would have it, Molly (the redhaired beauty above) and I wear the same size, so yay for being able to wear samples! So, last time I was over in London and it was slightly chilly but not actually cold, I realized it was the perfect autumn outfit. Styled like this, I really don’t think it looks particularly formal, just tres chic. 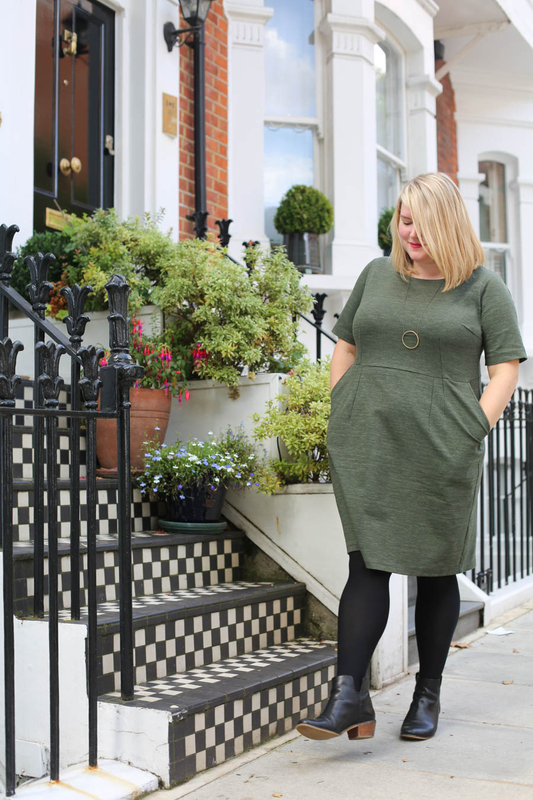 Ponte dress + tights is the perfect combo for autumnal weather, too – warm enough but without accidentally baking yourself when you get on the underground. I have a terrible habit of jamming my hands into pockets on dresses, but at least you can see from the picture above quite how deep they are! Another thing I was slightly unsure about when we developed the pattern was the neckline. I’m aware that not everyone shares my taste in design, so I try to make sure that I have patterns with something for everyone, when it comes to silhouettes, necklines, sleeve lengths and so on. Historically, I’ve always steered clear of any high necklines because I found they made my bust look overly ginormous and low. The Rivermont totally works on me, though! I think it’s the fact it’s tailored, has a high waist, and the neckline is broad without being bra-strap revealing. I recently attended an amazing lecture by Carla Mathis, an unbelievably sprightly style consultant in her late 70s, and when she shared her principles of necklines it made total sense – the Rivermont may be higher, but it’s broader (critical as you go high), and paired with a long necklace to draw that “V” across my upper body, it totally works. Of course, this being sewing, if you’d rather a deeper neckline or even a different shape, it’s totally do-able. 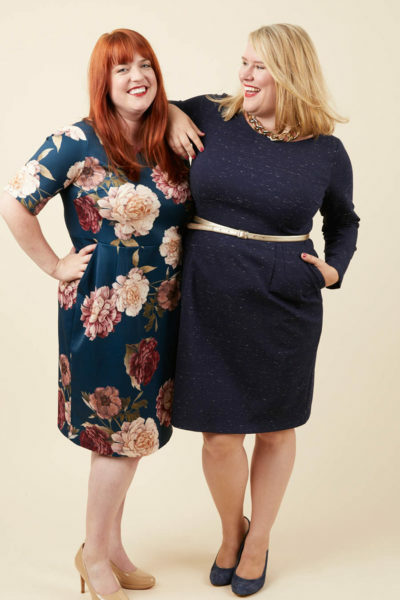 The Rivermont Dress & Top have a neckline facing, so you can basically draw whatever different neckline you’d like on the pattern, and then alter the facing accordingly. Would you be interested in seeing a tutorial on how to do that? What do you think – would you wear the Rivermont Dress outside the office? I couldn’t have predicted it, but I’m a total casual Rivermont convert! I love the look with tights and boots! My office isn’t super dressy (pumps are way overboard), so this look will keep the dress stylish and seasonally appropriate. I’m interested to see how this neckline looks on me. I tend to go for a lower scoop too, but you’re right, easy enough to change. What about a cowl neck? The big flowy turtle neck type. I have found hacks for regular cowl necks but not the turtle neck type. Love this but unfortunately I think I would be a US size 10 with a D/E cup size. Would it be easy to go down a size? I received the pattern, and I have a beautiful length of red ponte, but now i am very nervous. I am long waisted, and the more i study the top front and back, the shorter they look to me. I will have to research changing the length of pattern front and back before cutting. Can you direct me to any resources? I love this look. It would have been out of my comfort zone but I now would love to give it a go!!! I’d certainly wear this dress casually! Or to work in retail. .. Out for casual dinners, etc. Looks very comfy yet nice! Yes to the tutorial about how to change neckline shapes and then change facings accordingly! 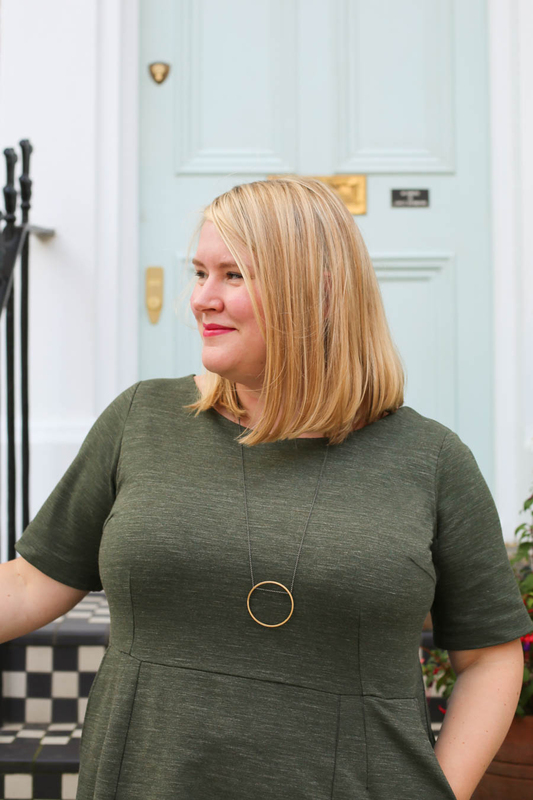 I have sloping shoulders so any broad neckline tends to make me look like my head is sitting on a triangle that starts at my shoulder points… So I love a narrow-ish V-neck, a sweetheart neck, or a U that doesn’t plunge too far. I would definitely wear the Rivermont casually. 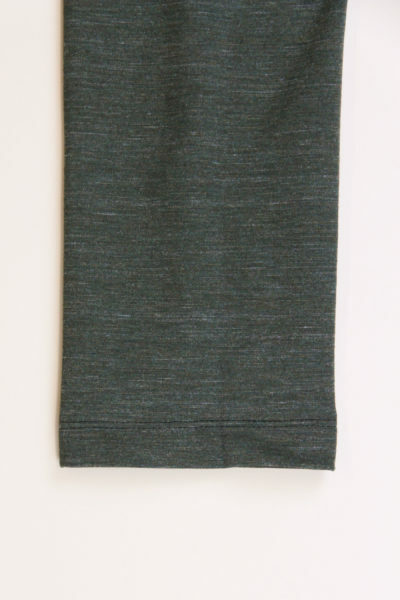 Its non-fussy bodice and handy pockets give it a very down-to-earth feel when done in a heathery fabric! 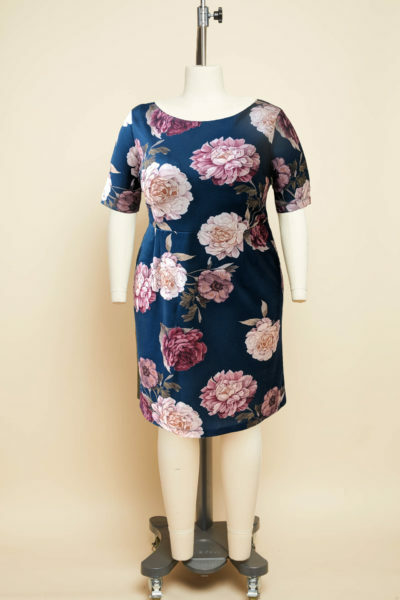 Love the look of this dress and like the neckline, I usually go for scoop necks because of my large bosom with the tip of the high nick but broader is great. If this pattern is available as a paper pattern I would love to buy it, I don’t get on with PDF dress patterns! All our patterns are available in paper as well as PDF! Hi, from your (sort-of) neighbor on Cape Cod, Jenny! I understand exactly what you’re saying about necklines, and despite being a devoted Talbots Stores girl, their stable of crew and turtlenecks make me feel like I’m just showing off my great, big expanse of sheer bosom! A year or so ago, however, I happened on an evening gown with a very similiar cut to the new Rivermont and it was surprisingly flattering. I’ve been wishing I could make it in a day dress, but dreaded all the altering necessary on such a closely fit bodice. Cashmerette to the rescue! In one of your surveys, I’d asked for a wiggle dress, but this does the trick. I’ve been traveling for the several weeks, but I’m itching to complete the ponte kit; thanks so much for creating all the Cashmerette patterns, Jenny. And, hey fellow seamstresses, Joann’s has their Boho collection on sale for 50% off! I found 60-inch wide stretch scuba in brown, red and black. Are you thinking what I’m thinking? Love this and yes! I’d love to see a tutorial on changing the necklines. Always open to new ideas and methods. I love a v-neck on me, but a lot of patterns are way too low. To draft the perfect neckline for me at my sweet spot on my upper torso would be great. Another great blog and beautiful pattern, Jenny. Thank you. I really love this look! Where did you buy that necklace?